WOW! This is such a great deal! 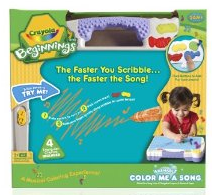 Head over to Amazon.com and get the Crayola Beginnings Color Me a Song for only $7.99. This is regularly priced at $32.99, that’s 76% off! My daughter got this last year for Christmas as she still uses it. She loves to draw on it and get us to “dance” to the music. This really is a fun gift idea! There’s a ton of great Crayola deals on Amazon.com right now plus you get FREE shipping with Amazon Prime! Amazon: HUGE Sale on Crayola products, up to 70% off! Great deals on Crayola products, up to 70% off!